Add expanding waistlines to death and taxes as the only certainties in life, with the average American just a few pounds short these days of being officially considered obese. But as a global obesity epidemic means that America and the world are getting fatter, some investors are seeing green as they bulk up on stocks of companies on the front lines of this 21st century Battle of the Bulge. 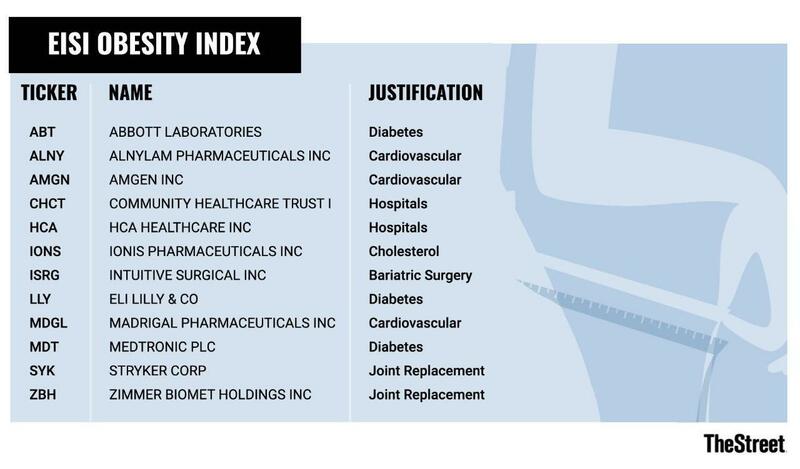 Research firm Evercore ISI recently rolled out the EISI Obesity Index to track the performance of stocks in the drug and medical-device sectors that stand to gain as the epidemic balloons. The new gauge joins the Solactive Obesity Index, as well as Janus Henderson Investors' Obesity ETF (SLIM - Get Report) . First launched in 2016, SLIM aims to mirror the Solactive index's performance by investing in 45 companies in what the financial-services firm estimates is a hefty, $2 trillion-a-year market of anti-obesity treatments. However, experts say that investing in anti-obesity efforts doesn't involve finding a silver bullet or a guarantee of big, short-term gains. But rather, it's a long-term play -- just like the fight against the epidemic itself. 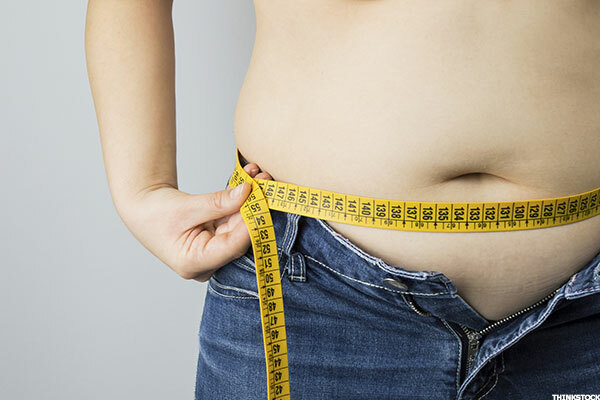 "When you are talking about obesity, there is an underpenetration from a treatment perspective," said Vijay Kumar, managing director for medical supplies, devices and life science and diagnostic tools at Evercore. "Worldwide, obesity has tripled since 1975 -- and given lifestyles, it is not changing for the next 20 years in terms of market growth." Eleven of the 12 stocks that make up Evercore's Obesity Index have outperformed the S&P Composite 1500 since 2017, including Abbott Laboratories (ABT - Get Report) and Amgen Inc. (AMGN - Get Report) . Both are owned by Jim Cramer's Action Alerts PLUS charitable trust. The index as a whole has outpaced the S&P Composite 1500 by 80% since 2017 began, although those gains have leveled off a bit so far in 2019. The gauge has also outperformed the S&P 1500 Health Care Index, beating it by 54% since 2017, according to Evercore. All told, the EISI Obesity Index has posted a 6.8% year-to-date absolute return and a 28% absolute return since 2018 began, Evercore's Kumar said. "The Obesity Index's performance against health care reinforces the idea that focusing on treating obesity represents an alpha factor relative top allocating to health care in general," Evercore analysts who devised the index wrote in a recent research note. The companies tracked by the index produce a range of products that are growing in demand thanks to ever expanding waistlines across the planet. After all, some 2 billion people were considered considered overweight as of 2016, according to the World Health Organization. This massive weight gain has pushed up demand for drugs and devises to treat a range of ailments and diseases, from diabetes and heart disease to knees that give out early. Amgen, for example, is researching a new drug that would use a protein that has shown promise in increasing people's interest in low-fat foods and making consumers feel satiated for longer periods. Similarly, Abbott produces a glucose monitoring system for use by diabetics. Cramer and his Action Alerts PLUS research team wrote in a recent note that Abbott's FreeStyle Libre continuous glucose monitor has been a big hit, with sales up $530 million (+28.3%) and significant growth potential given the 400 million people living with diabetes across the world. "The FreeStyle momentum is strong," said Zev Fima, an analyst at AAP, noting that Abbott has "one of the best stories for 2019." Meanwhile, the Solactive Obesity Index tracks 41 different companies with a stake in the battle against obesity, with the results calculated on a 2011 baseline. But unlike Evercore's Obesity Index, it focuses not only a pharma firms, but also on companies that offer weight-loss programs, plus-sized clothing and dietary supplements. The index, created by German-based index provider Solactive AG, "tracks the price movements in shares of companies positioned to profit from servicing the obese, including biotechnology, pharmaceutical, healthcare and medical devices companies," the company noted. The Solactive Obesity Index measures not only the performance of companies involved in anti-obesity treatments, but also those that sell things like plus-size clothing. The gauge has more than doubled since 2011, rising from a baseline of 100 points some eight years ago to more than 236 today. And in terms of real-world dollars, the stocks in the Solactive index have gained 137.8% over the past eight years and 4.9% year to date. Janus Henderson's Obesity ETF, which tracks the Solactive Obesity Index, has a 4.1% gain so for for the year despite a 16.1% drop over the past three months. Since its launch in June 2016, SLIM has posted a 10.5% return. Still, there's a considerable amount of volatility baked into obesity investing, in particular since drug companies make up a large part of the field's players. For example, Evercore's Obesity Index has an annualized realized volatility of 19.4%, compared to 13.2% for the S&P 1500. Consider index component Madigral. Its stock price rocketed 154% last May after a study on a treatment it's developing for fatty liver disease impressed investors. That alone was enough to push the entire index up 12.6% relative to the S&P 1500. Such volatility makes the Evercore Obesity Index more valuable for tracking obesity-investment gains over the long term than the short term, according to Evercore. "It is worth reiterating we believe the index has significant long-term value as the world combats the growing obesity epidemic," Evercore wrote in a recent note. "But it does not lend itself to a near-term play given the volatility and unpredictability of drug trials." Still, not everyone is convinced that there are fat profits to be made fighting obesity. Debbie Wang, a Morningstar senior equity analyst, sees the potential for companies like Abbott to capitalize on obesity-driven medical issues, but isn't sold on the bigger concept of obesity investing. "It strikes me that it has more marketing appeal behind it than any sort of investment rationale," she said.